That's a truffle. Not too appetizing, but hey! A few weeks ago, I ordered an expensive dry-aged steak from one of the world’s top steakhouses. Most dry-aged steak is aged for 28-35 days, but this steak was aged for 8 months. To top it off, I added 5 grams of truffle shavings for additional flavor, successfully making the steak cost ~$200.00. How did it taste? And what does this have to do with blogging? Yes, the steak was expensive, but the fascinating story made my palate go nuts! As I mentioned earlier, this steak was aged 8 times longer than other dry-aged steaks. Additionally, I added 5 grams of truffle shavings, which cost ~$15 per gram. (If you’re unfamiliar with truffles, they are one of the most expensive ingredients in the world. They grow up to a meter below the ground, and you need a specially trained dog or pig to find them). (The steak is aged longer, has expensive ingredients, and oh no, I might not be able to get any). This steak MUST be good. The story demands it! What’s this steak have to do with your blogging and business? Well, as you saw, each detail of the steak was refined and packaged into a story that shaped my perception of it. That’s why I was willing to pay $200.00 for it. Online, you should do the same thing. You’ve got to find your ingredients, scarcity, and of course, what makes your service different (like how long you spend working with a client for example). And once you know what that is, you’ve got to hammer it home. Nail it down, and communicate it in bite-sized chunks so people know exactly what you’re offering them and why it matters. 1. Thesis uses bulletproof code that’s tailor-made to rank high in search engines. It’s optimized for SEO, right out of the box, unlike many other free WordPress themes. 2. Chris Pearson refined Thesis options over the last few years, and tweaked it for maximum performance and durability. It’s not simply a new WordPress theme, it’s a theme framework that has been refined to perfection for YEARS. And while that just scratches the surface, you get the idea. How can you create these bite-sized chunks for your business or blog? First, think about what results your potential customers want from you. Then, take inventory of what you do to achieve those results. Do you use proprietary methods? Do you do anything different than your competition? Do you have special ingredients? If so, elaborate on them. As one more example, let’s look at Social Triggers. My blog is the only marketing blog (that I know of) that combines human behavior research with human behavior on the web. What’s that mean? It means that my advice is backed-up with experience and DATA. And then what do I do? I tell everyone about it. It’s my bite-sized chunk, and it shapes your perception of my blog (or so I hope :-D). What makes you amazing? And what’s your story to back it up? 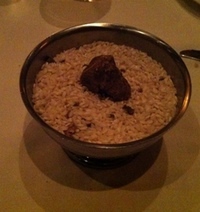 (Oh, and for the record, the steak tasted great, but I HATE the smell of truffles. Go figure. They are a fungus, and they grow underground, heh).